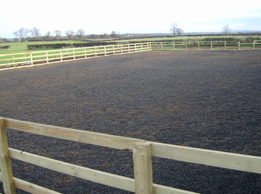 Outdoor arena and gallop design installation service. In 2004 we made the decision (after years of nagging) to install our own outdoor arena. During many visits to various events with the children , instead of watching them I was busy digging around in the surface of the school finding out what it was made from. Two years went by and after a quotation for an arena of £30,000, I’d had enough and embarked on the project myself. There are good arena’s and a lot of bad arena ‘s. The key to a good arena is design structure and correct products. You can’t afford to get it wrong. When it rains how many arena’s stand in water? In 2008 we experienced high and sometimes dramatic rainfall, some of our fields stood under water for most of the summer. Events all over the countryside in fields and outdoor arena’s were cancelled. The only dry spot on our farm was the arena, in fact it was dryer than some indoor arena’s with leaky roofs I have seen. We are that pleased with our arena I’ve decided to offer our services to design and install arena ‘s for others. The only way forward is to come and see for yourself and where possible pick a wet week ! so you can see for yourself how good it is .